Maurice Rosenberger was an engineer for General Motors during the 50's and 60's and worked on the development of the HydroMatic transmissions among other things. He retired to Tucson and was an active member of the Tucson Corvair Association until his death at age 92. Very few of us knew what his first name was. He was just Rosie to us. He was a car guy and active in playing with all things automobile until his passing. 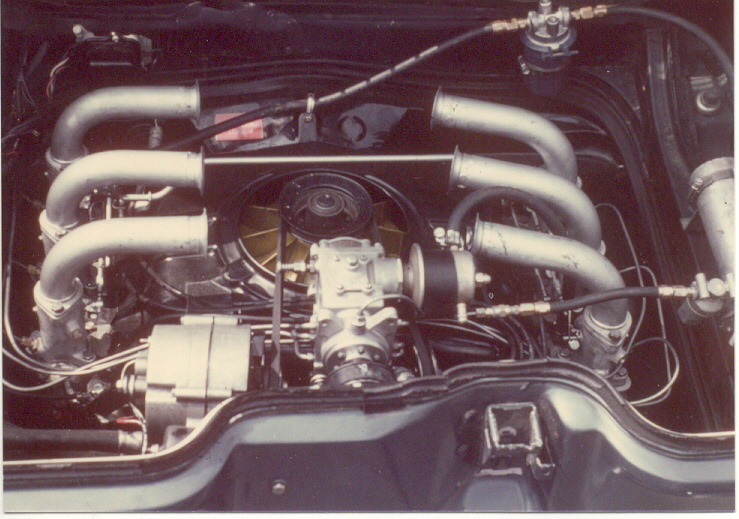 Among some of the treasures that we still have today are these photos and a letter from his friend Ed Connolly regarding a fuel injection system that was used on Jerry Thompson's Stinger in 1966. Below these items are some photos of other treasures from Rosie's garage that appear to be products of the Chevrolet model shop including a couple of different intake manifolds and a set of big-valve heads. 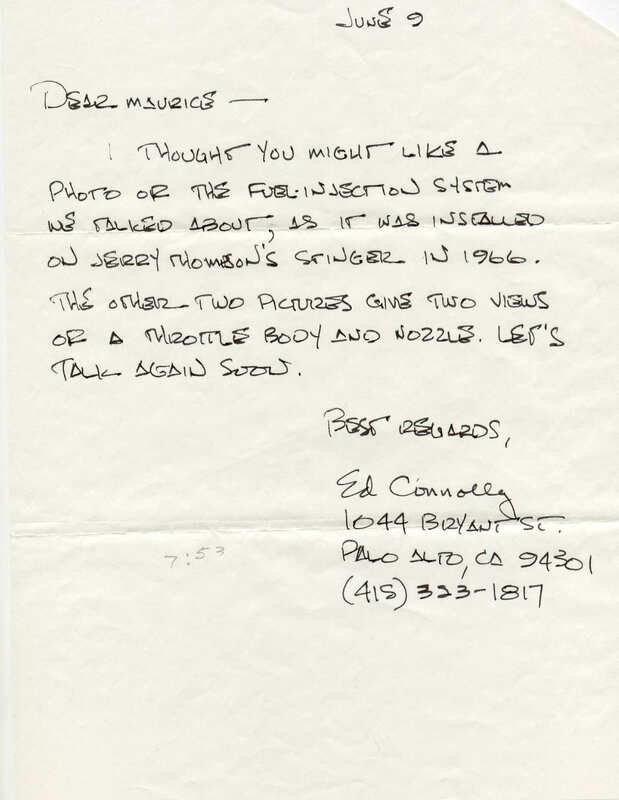 I wish we had a little more history but we can assume from this letter that Rosie has talked to Ed regarding fuel injection for the Corvair engine sometime along the way. The envelope that this letter came in was post marked June 10, 1988. The photos below were in the envelope with the letter. A little bit of history to be sure. If anyone out there has additional information I would love to add it to what we have here. Thanks, Van. These are a set of cast manifolds that came from the Chevrolet Model Shop via Rosie's garage. 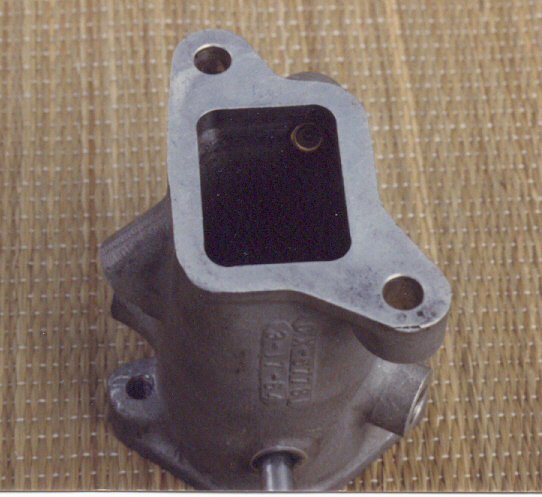 The size of the inlet holes and the bolt pattern make one believe that they might have been the ones used for the fuel injection system shown in Ed's pictures above. Click on any of the photos to see a bigger view. 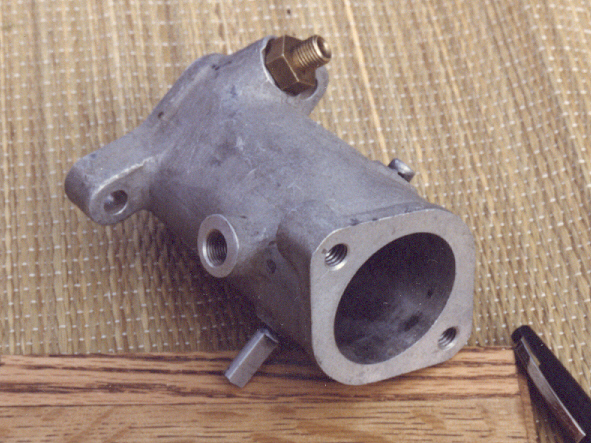 A set of fabricated steel intake manifolds. It's hard to say for what purpose they were intended. Ideas?? These are a set of big-valve heads that were part of the mix. Either of the above manifols will bolt to them. Again, just click on the images for a larger view.